Purinergic signaling is linked to neurodegenerative and proinflammatory damage during pathological conditions such as hypoxia, but involvement of this pathway in brain damage in fish exposed to environmental hypoxia remains unknown, and we propose dietary supplementation with caffeine in order to improve the immune response. Therefore, the aim of the study was to evaluate whether the enzymatic purinergic signaling pathway is associated with inflammatory brain damage in Nile tilapia (Oreochromis niloticus) exposed to environmental hypoxia and whether dietary supplementation with caffeine (5% and 8%) can prevent these changes in purinergic signaling. Animals were randomly divided into six groups (A–F, n = 6 per group, in triplicate), as follows: groups A–C were submitted to normoxia, while groups D–F were submitted to hypoxia. Groups A and D received the basal diet, while groups B and D and groups C and F received a diet containing 5% and 8% caffeine, respectively, and fed with their respective diets for 21 days. After 21 days, aeration was disconnected (groups D–F) and the dissolved oxygen levels were maintained as follows: group A (6.55 ± 0.23 mg/L), group B (6.51 ± 0.24 mg/L), group C (6.58 ± 0.22 mg/L), group D (1.23 ± 0.11 mg/L), group E (1.20 ± 0.15 mg/L), and group F (1.18 ± 0.13 mg/L). Cerebral triphosphate diphosphohydrolase (NTPDase) using adenosine triphosphate (ATP) as a substrate and 5′-nucleotidase activities decreased in fish exposed to 72 h of hypoxia compared with the normoxia group, while adenosine deaminase (ADA) activity and levels of nitric oxide (NOx) metabolites were higher. Dietary supplementation with 5% and 8% caffeine prevented all alterations elicited by hypoxia, with the exception of ADA activity in the case of 5% caffeine. 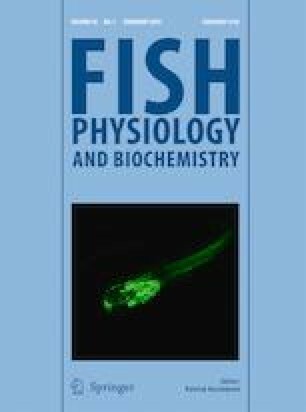 Based on this evidence, our findings reveal that nucleotide/nucleoside hydrolysis is modified in the brains of fish exposed to 72 h of hypoxia, contributing to inflammatory damage, which apparently is mediated by excessive ATP content in the extracellular medium and by excessive NOx production. Also, the use of a diet containing 5% and 8% caffeine prevented these alterations (except 5% of dietary caffeine on ADA activity) and can be considered an interesting approach to preventing the impairment of immune and inflammatory responses elicited by hypoxia, principally the inclusion of 8% caffeine. This study was financed in part by the Coordenação de Aperfeiçoamento de Pessoal de Nível Superior—Brazil (CAPES)—Finance Code 001—PhD fellowships to C.F. Souza and M.D. Baldissera. A. S. Da Silva and B. Baldisserotto are funded by CNPq (Conselho Nacional de Desenvolvimento Científico e Tecnológico) research fellowships and S.N. Descovi by an FAPERGS (Fundação de Amparo à Pesquisa do Estado do Rio Grande do Sul) undergraduate fellowship. All procedures were approved by the Ethical and Animal Welfare Committee of the Universidade do Estado de Santa Catarina (protocol 9959260218).